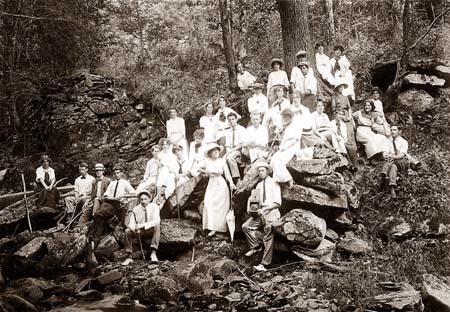 [ June 11, 2001 Issue ] Albert Blakeslee, head of the Connecticut Agricultural College summer school from 1907 to 1913, heads a 1913 outing at Codfish Falls in Storrs. He is seated in front, holding a cane. Holding a camera is Jerauld Manter, entomology professor from 1912 to 1948 and unofficial college photographer for decades. [ July 30, 2001 Issue ] Summer courses, primarily for Connecticut school teachers, began around 1901 at Connecticut Agricultural College. The first courses for college credit were offered in 1937 by what was then Connecticut State College. 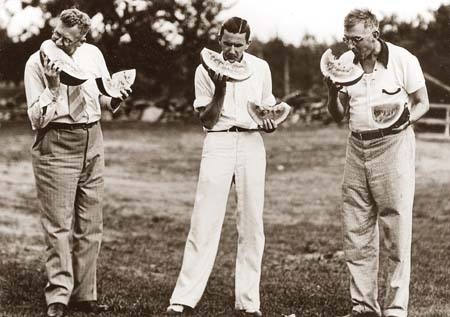 Enjoying the watermelon at the first summer school picnic, from left, are Charles B. Gentry, professor and first dean of education; P. Roy Brammel, summer school director and first dean of continuing studies; and Sumner Dole, athletics coach and first dean of men.